The Al-Abbasi Mosque with its tall minaret and dome waits for worshippers and visitors in Mohamed Ali Street in the Al-Arab district of the Canal City of Port Said. 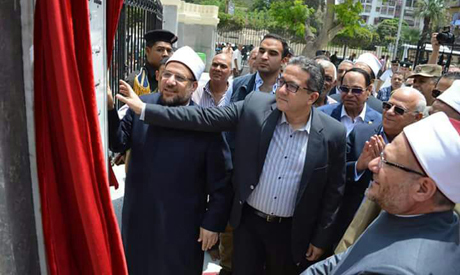 It is scheduled to be reopened this Friday by Minister of Antiquities Khaled El-Enany and Minister of Endowments Mokhtat Gomaa, after almost two years of restoration that has seen it hidden under scaffolding as workmen strengthen and restore its walls. The mosque had been suffering from damage caused by environmental pollution, a high level of humidity, and leakage from the madiaa (a water fountain used for ritual ablution). Mustafa Waziri, secretary-general of the Supreme Council of Antiquities (SCA), said that the restoration work had been carried out according to the latest scientific methods. “Every effort was made to ensure that all the original architectural features were retained,” he said. The restoration of the mosque had helped to ensure that important individual monuments were preserved for future generations and neighbourhoods were revivified and upgraded, he added. Gamal Mustafa, head of the Islamic and Coptic Antiquities Department at the ministry, said the mosque was the second oldest mosque in Port Said after the Al-Tawfiki Mosque. It was built by the khedive Abbas Helmi II in 1904 among 102 mosques in different governorates built in the same period and was inaugurated in 1905. The mosque played an important political role during the Tripartite Aggression against Egypt in 1956, as it was used by the Popular Resistance Movement in the city. It was also used by late president Gamal Abdel-Nasser for prayer when he visited Port Said. “The mosque lost some of its authentic elements during development work carried out before its listing in 2006,” said Gharib Sonbol, head of the Central Administration for Restoration. He said that according to original drawings and photographs, the mosque’s original wooden painted ceiling was removed and replaced by a concrete one. The original lamps were replaced by modern ones. The neighbourhood of the mosque was also badly damaged during the 1967 War with Israel, when the mosque again sheltered the area’s inhabitants. Despite the damage the building has suffered, it still retains the majority of its authentic elements as every corner has engravings in Kufic writing decorated with foliage ornamentation and arabesques. During the restoration work carried out on the windows and doors of the mosque, restorers stumbled upon a relief written in Kufic writing showing several verses of the poem Al-Burda written by the Imam Al-Busiri in praise of the Prophet Mohamed. The doors of the mosque are also decorated with 16 verses from Al-Busiri’s work.